Please join your fellow colleagues at the opening reception for this year’s SCA conference aboard the Queen Mary in Long Beach. In its time, the Queen Mary transatlantic ocean liner was unique as a grand new way for ocean travel with its elaborate Art Deco touches and upscale amenities. During its 30+ active years, it transported Hollywood stars, royalty and dignitaries across the Atlantic Ocean, only taking a break during WWII to serve as a troopship. Enjoy hors d’oeuvres and beverages (cash bar) in the beautiful Queen’s Salon until 9:30 PM. Admission to the Opening Reception is included in the AGM Full Registration fee and a $35 fee will be charged for an additional guest. Long Beach Passport - this is a free bus service that travels from Downtown Long Beach to the Queen Mary. The closest stop is a half mile/10 minute walk down Ocean Blvd to Pine Ave. It runs approximately every 15 minutes until 8pm and then every 30 minutes. Find the schedule and map here. Ride share (Lyft or Uber) - A Lyft or Uber from the Hilton to the Queen Mary is likely the most economical option after the Passport. And it’s even cheaper if you share the ride/split the cost with other attendees! Drive and park at the Queen Mary - If you have your car and would prefer to drive, it’s a quick 2.4 mile/10 minute drive. Self parking is $18/per car. Valet is $27/per car. 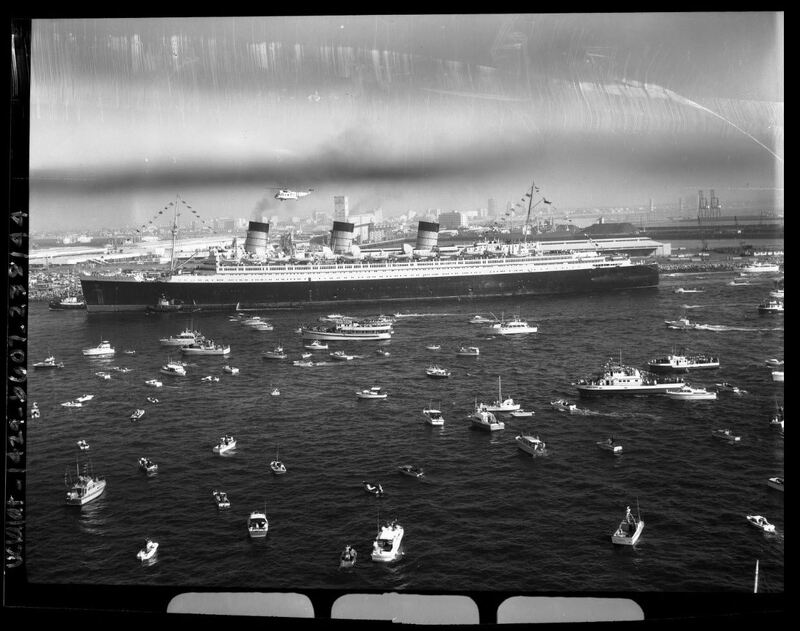 Queen Mary steamliner sailing into Long Beach, Calif., 1967, Los Angeles Times Photographic Archives (Collection 1429). Library Special Collections, Charles E. Young Research Library, UCLA.